The Drums of War are Beating in… the Vatican?? Vatican officials have indicated that the Holy See will support the use of force against ISIL and Boko Haram. As the Catholic Church observed the solemn Lenten season, Vatican officials considered a solemn question, one rarely broached by the Church in modern times: Should the Holy See endorse war? Specifically, the Vatican is considering backing the use of internationally sanctioned force against violent Islamic extremist groups including the Islamic State of Iraq and the Levant (ISIL) and Boko Haram. The Vatican appears poised to support the use of force. Any endorsement would mark a dramatic shift in the Vatican’s approach to armed conflict. The modern Vatican has historically been opposed to the use of force on almost every occasion. For example, the Vatican explicitly opposed both the 1991 and 2003 US-led wars in Iraq as well as proposed airstrikes against Syria in 2013. Regarding the 2003 Iraq War, Pope John Paul II commented that war is “always a defeat for humanity.”[i] However, contemporary challenges presented by ISIL and Boko Haram have caused the Vatican to cautiously and reluctantly change course. 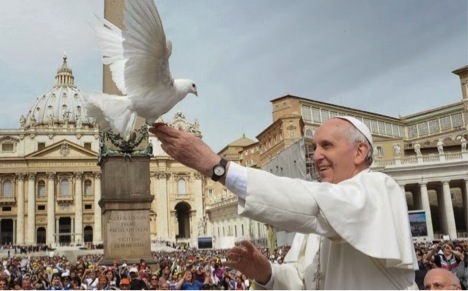 Pope Francis, known for his compassionate demeanor and named after the peaceful St. Francis of Assisi, first implied the Vatican might support the use of force in August 2014 when he tacitly approved of American airstrikes against ISIL in Iraq. The Pope commented that “it is licit to stop an unjust aggressor.” He stopped there however and refused to explicitly approve of the US operations. He further qualified that only the international community, as opposed to a single nation, could decide exactly how the aggressor should be stopped. 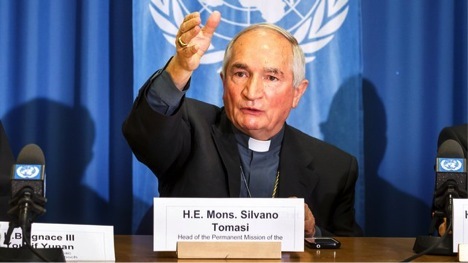 [ii] More recently, on 13 March, Italian Archbishop Silvano Tomasi, the Vatican’s top diplomat at the United Nations in Geneva, called for the international community to defeat ISIL by “achiev[ing] a political settlement without violence.” He conceded though that such a settlement might not be possible. In that case, Tomasi bluntly asserted “the use of force will be necessary.”[iii] Tomasi appeared to again endorse the use of force on 2 April, this time against Boko Haram, at the Special Session of the Human Rights Council on the Situation of Human Rights in Nigeria. A in the previous statements, he emphasized that any military action must be coordinated by the international community. [iv] If the Vatican does support the use of force outright, the position would be grounded in both international law and Canon law. 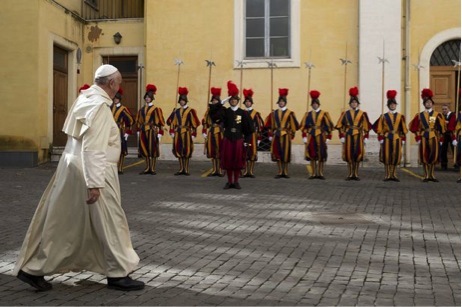 Vatican support for the use of force is grounded in international law. The Vatican has made clear that any Vatican endorsement of the use of force will be fully compliant with international law. The prohibition against the use of force is a fundamental and foundational principle of the UN charter. Article II, paragraph 4, prohibits “the threat of force against the territorial integrity or political independence of any state or in any manner inconsistent with the Purposes of the United Nations.” The inclusion of only these two situations implies that force is legal under international law in other situations. At least four have been identified. First, the use of force is always legal if a UNSC resolution has authorized it. The UNSC might authorize force against ISIL, although crossing veto powers usually preclude the UNSC from agreeing on military intervention. Second, the use of force is always legal when used in self-defense. As the leader of the world’s 1.2 billion Catholic Christians, the Vatican can plausibly claim that its people are threatened. Third, the use of force is always legal by invitation. Some countries in which ISIL and Boko Haram operate have already invited others to combat Islamic extremism within their territory. Fourth, the use of force might be legal if carried out in support of humanitarian intervention. The Responsibility to Protect (R2P) Doctrine obligates all states to protect oppressed peoples from manmade catastrophes. [v] The Vatican appears to look toward R2P as an international justification. Archbishop Tomasi stated “There is a common human dignity we all share and it should be protected at all costs,” and “We are not fighting for Christians simply because they are Christians. We start from the foundation that they are human beings with equal rights.”[vi] In the R2P context, the use of force is legal if the force is used to support a just cause, with the right intention, as a last resort, is proportional, and offers a reasonable prospect of success. From the Vatican’s perspective, putting an end to the widespread and systematic killing of Christians and other minorities is a just cause. The intentions would be “right” in the sense that the force would be used to stop the killings, not to take territory or achieve a prohibited purpose. The Vatican has made clear that a political solution must be sought out first and only if that failed should force be used as a last resort. The Vatican would only support proportional means that targeted only the violent Islamic extremists. Finally, any internationally-sanctioned use of force like the Vatican is calling for would offer reasonable chances to defeat the violent groups assuming a proper military strategy. Vatican support for the use of force is grounded in Canon law. The elements are strikingly similar to the R2P elements described above. The first element speaks to “just cause” and “right intentions.” It also requires that the aggression is lasting, meaning a short-term incident would not suffice. ISIL certainly appears poised to be a menace for the long-term. The second element is a “last resort” requirement. The third element is a “reasonable prospect of success” requirement. The fourth element speaks to proportionality and gives special consideration to the horrific destructive capability of modern weapons. The Catechism makes clear that endorsing the use of force is a matter of grave concern that demands close and extremely careful consideration. The Catechism also emphasizes moral legitimacy, meaning that force can only be used for righteous purposes to counter aggression. The Vatican’s position is indicative of dangerous times. The Vatican normally pursues exclusively diplomatic solutions. The fact that the Holy See is backing the use of force against violent Islamic extremist groups is a sign of just how dangerous these groups have become to the world. Pope Francis may be best known for his compassionate outreach and “turn the other cheek” philosophy but the global situation might offer him no alternative to war. [v] It should be noted that R2P is not yet universally recognized as international custom. For more information about the history of R2P in the UNGA, see http://www.un.org/en/preventgenocide/adviser/responsibility.shtml. Categories: canon law, international law | Tags: Boko Haram, canon law, Holy See, international law, ISIL, ISIS, just war theory, Pope Francis I, R2P, Vatican | Permalink.